Do you ever really need help with something? Do you ever want to spend time learning something new? Once you learn that new thing, what do you do with it? As teachers, we hope our students take the new things they learn and spend time teaching it and sharing it with others. Do we do the same? Our Sunday School lesson today was on Heaven. We are spending time learning what Heaven is really like according to the Bible. Will we know one another? What will we spend our days doing? It was mentioned that God gives us our talents here on Earth, so we can practice them for Heaven. On a tangent, our talents can draw others to us where we can use the time spent as a witness to others. I am a self-proclaimed tech nerd! If I don't know how to do something, I figure it out! Even today, someone asked me how to create a header for their new blog. I had forgotten, so I took time searching, redoing my own, and sharing that information with her. My prayer this Sunday is that I will do the same with God. If I have a question, why not turn to Him for the answer rather than searching for it myself. He is available to help me 24 hours a day. Why do I hesitate to turn to him at times? 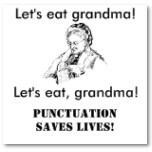 Sunday, September 25, 2011 is National Punctuation Day. If you don't think punctuation matters, just take a look at this! I have selected Wednesdays to share tips of what works well in my classroom. As a 4th grade teacher, I experience kids who won't ask their teacher questions. In fact, it is a proven, researched fact that something happens between 3rd and 4th grades where kids stop asking for help. I have found a proven strategy to give kids one on one individualized, differentiated instruction is by teaching in small groups. Currently, my kids participate in small groups for reading and math. I have found that kids become more successful because the "fear factor" is gone because of a small group setting. I can also catch struggles before they become problems. Often, the teacher moves from the role of instructor to facilitator. Small groups have transformed my students and their test scores. I encourage any teacher to become a small group facilitator! This summer, I was given the opportunity to attend the ISTE (International Society for Technology in Education) Conference in Philadelphia, PA. I discovered a great site to encourage project based learning in my classroom. This site is TripWow! I am always interested in products that other teachers use in their classrooms that they can't live without. I want this to be a place where we can share those must-haves that we use on a daily basis to engage our students. My number one must have is "Eyelighters." Eyelighters are plastic reading strips that highlight text. My students use them to follow along as we read, to locate information and test answers, and to eyelight vocabulary words, synonyms, opinions, etc. I love this little tool! You can order Eyelighters with your Scholastic Book Club Bonus Points. Here is their description: Scholastic Bonus Points and Classroom Bonuses are awarded for the .... Eyelighter. Reading Strips. Yellow 6" each. 37407 Pack of 12 •. 350 Bonus Points. You can also do an Internet search to find several companies that sell Eyelighters. 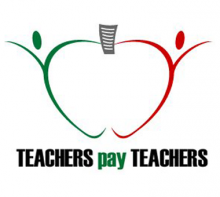 Use coupon code 10THANKS to receive $10 off downloadable ebooks from Scholastic Teacher Express. This link will take you to the Dollar Deals, so you can get 10 books free. I got mine, and I can guarantee they are great teacher resource books! Enjoy shopping! Sunday is going to be my day to share with you some of the great blogs I follow. Thanks to you all for sharing such great resources that help us all in our daily instruction. However, today I'm sharing my blog. In fact, I just started it yesterday, but I can't wait for it to grow and build. So, I am joining Lesson Plan Diva's Linky Party. Please take time to view my Facebook page. I can't wait to view all of your blogs! 2)Respond to adults with ma'am or sir. 4)Never give personal information over the internet. 8)Make eye contact when someone is speaking. I have always been very reluctant about being a blogger. Why? I've never considered myself a writer. I am a very literal writer and can produce a research paper worthy of an A.
I was recently asked to write a blog post for the Alabama NBCT Network. I fretted for days over what to write, but then it just came to me. I found it a very freeing and rewarding experience. You can find that post here. So, as they say, the rest is history! I know that God called me to be a teacher. He has blessed me with a gift of teaching and encouraging children and adults. I spend my days in teaching a super group of 4th graders. On the side, I work with teachers by teaching various technology related workshops. 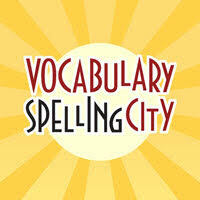 I also work with VocabularySpellingCity in promoting their fantastic site. My life revolves around my God, my family, and my career. I want to use this blog to glorify Him as well as share thoughts, experiences, tragedies, and triumphs that take place in my classroom and professional career. I hope you share in this journey with me.